Reply to Mr Adamson concerning Captain Gray', who has severe dropsy. Cullen is wary of tapping, as it may prove fatal: 'if Dr Foster & you shall think otherways & to enter upon it with the prognostic of its either killing or curing & Capt. Grays taking it upon this footing I shall have no objection'. Otherwise he suggests cantharides as a diuretic or rubbing his belly with oil. 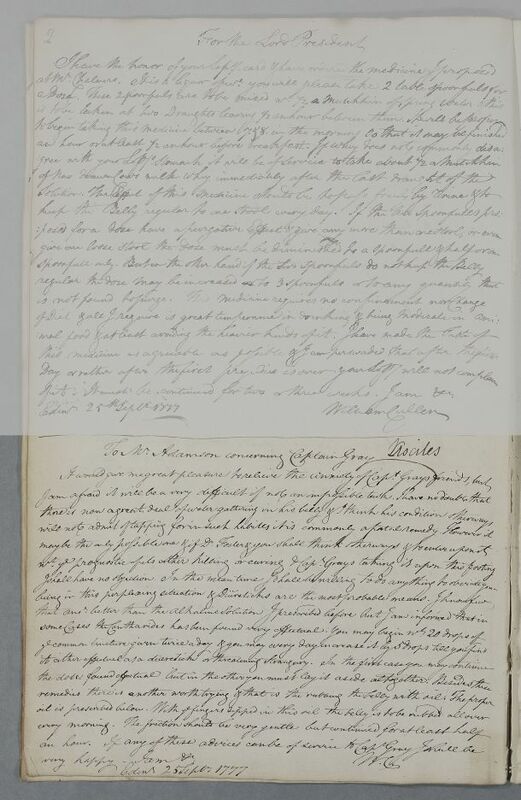 Summary Reply to Mr Adamson concerning Captain Gray', who has severe dropsy. Cullen is wary of tapping, as it may prove fatal: 'if Dr Foster & you shall think otherways & to enter upon it with the prognostic of its either killing or curing & Capt. Grays taking it upon this footing I shall have no objection'. Otherwise he suggests cantharides as a diuretic or rubbing his belly with oil. very happy. I am &c.